Altang’s name describes pretty much everything about the dish. Al refers to egg, tang means soup. It’s a soup of fish roe, and a lot of them. The soup is filled with white small sausage-looking creatures, which are roes of pollack. Pollack roe is the main ingredient of the dish. While roes are usually sliced up when used for pasta dishes, for altang, they are served whole. The texture of cooked roe may take you by surprise. The egg mass is firm yet soft. When chewed, the roe easily breaks up, filling the mouth with the grainy texture of millions of tiny eggs that have been released. Altang roes don’t have much taste themselves and it is the broth that determines the taste. 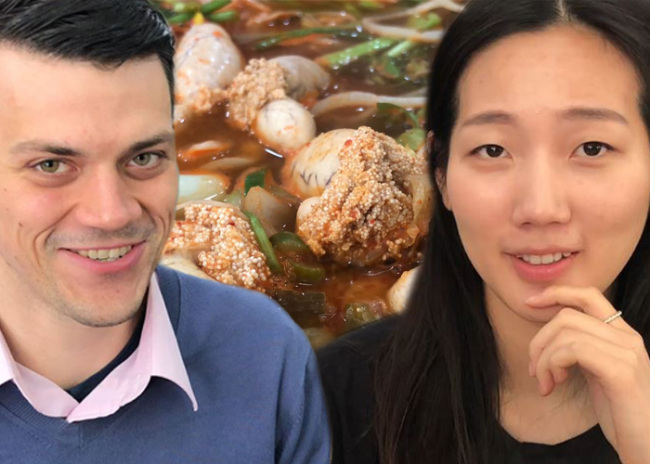 Though the broth looks spicy due to its flaming red color, the overall taste is refreshing -- as Koreans would say -- as the dish is cooked with seafood. Added vegetables, including bean sprouts, add more texture and color to the soup. After feating on the pollack roes, drinking up the remaining broth is a must. The broth is filled with the eggs -- the bits of the roes -- as they break up little by little when being cooked. The soup origins from Gangwon Province, where pollack is commonly found thanks to the cold water. Eaten with a bowl of rice, the soup serves as a hearty meal on a cold day. It is also commonly enjoyed with drinks, especially soju. In Korea, pollack roe are frequently sold separately at the fishmonger‘s section of supermarkets.